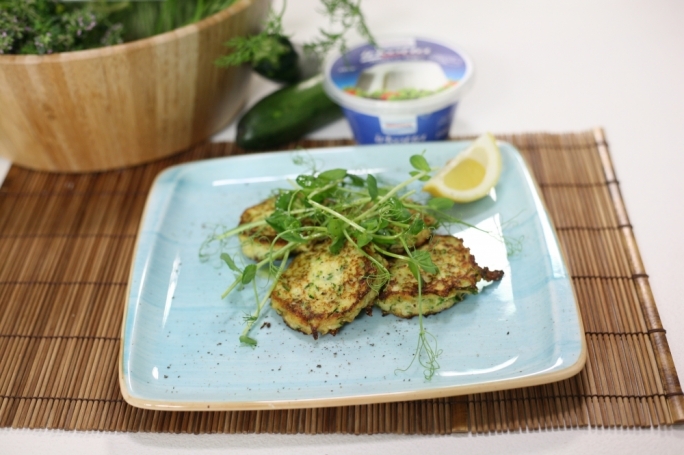 These zucchini and ricotta fritters are a great way to trick the kiddies into eating their greens. Michael Diacono uses polenta in his recipes to make these fritters gluten-free. Simmer the white wine in a small saucepan with the garlic, onion and bay leaves until the mixture has reduced by one third. Grate the zucchinis and place in a colander over a bowl. Add some salt and allow the water to come out of the veg for approx. 10 mins. Squeeze any excess out of the zucchini and place into a bowl. Add the ricotta and the chilli. Add the polenta and the pistachios and mix well. Add the fresh herbs and lemon zest. Remove the garlic, onion and bay leaves from the white wine and add just a little to the mixture until soft but not runny. Add more polenta if the mixture becomes too wet. In a deep frying pan melt the butter in the olive oil and when the fat is hot add spoonfuls of the batter to the pan, leaving enough space so that they do not stick to each other. Cook until golden, flip over and cook the other side until golden (a couple of minutes on each side). Top with pea shoots or other greens and drizzle with olive oil.